A simple tutorial on how to make roasted tomatoes! Every once in awhile, I like to share a “How To” post. Sometimes things come off too complicated or we just don’t think of these simple little things we can easily do that can actually make a huge difference in the flavor of our meals! Roasted garlic and toasted coconut are two of my favorite ingredients that make it easy to change the flavor of so many dishes! 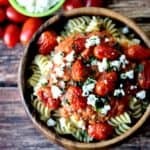 Today I am sharing how to make roasted tomatoes because they too can add more depth to your dishes – especially pasta dishes! 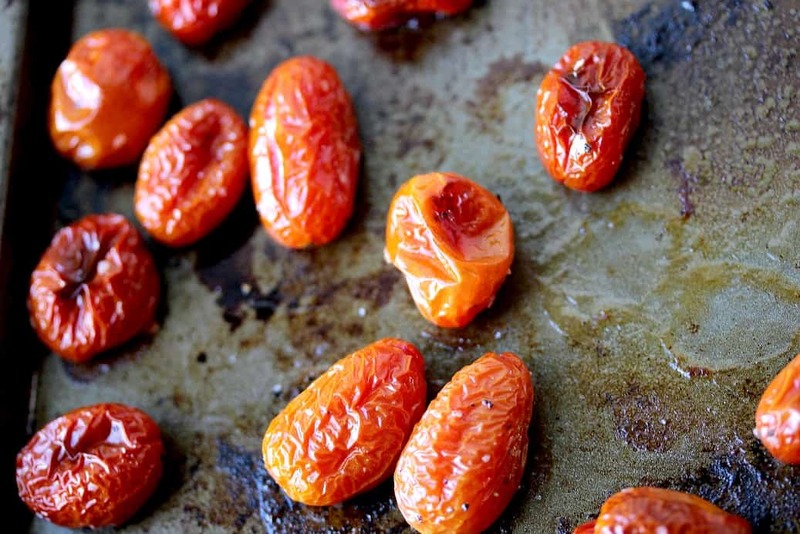 Making roasted tomatoes is actually really easy. I usually start with grape or cherry tomatoes because you don’t have to worry about doing any chopping. Just wash, pat dry, and toss them into a small bowl. This post may contain affiliate links – see our Disclosure Statement for more information. Drizzle the tomatoes with olive oil and sprinkle on some salt and pepper to taste. Give them a good toss so they are all covered in the oil. Spread the tomatoes onto a sheet pan. I would recommend lining your pan with a Silpat mat to make cleaning up any baked on tomato juices easier. You can also line the pan with foil. Baked at 400°F for about 15 minutes, or until they are all collapsed. 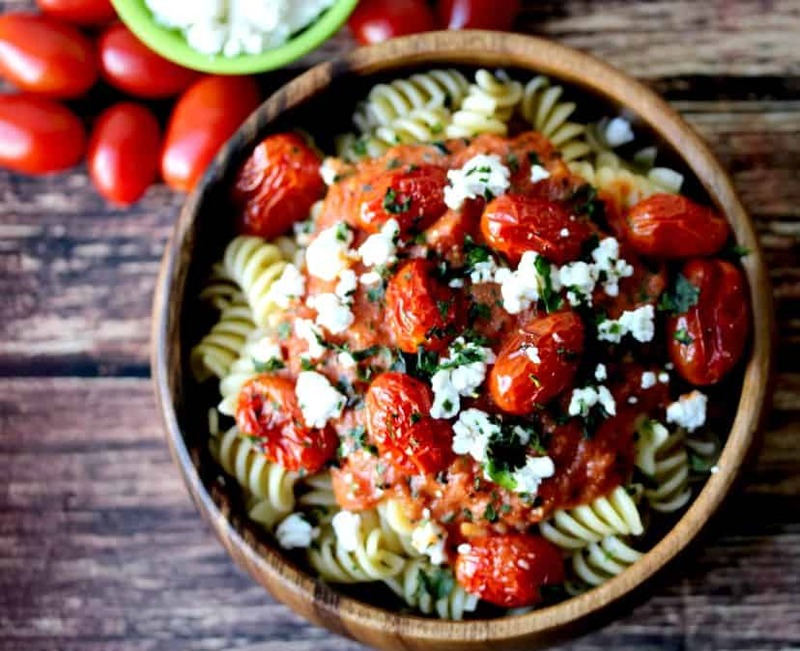 These roasted tomatoes go great tossed into just about any kind of pasta dish! I most recently used them in my Pasta with Creamy Goat Cheese Tomato Sauce recipe, but they even work well in pasta dishes that don’t have any type of red sauce! I also like to use them in pasta salads, veggies wraps, and paninis! I hope this quick and easy tutorial on how to make roasted tomatoes has inspired you to give them a try! I am always looking for new ideas and would love to know how you are planning to use them too! Preheat oven to 400°F. Place the tomatoes into a small bowl, drizzle with olive oil, and sprinkle on salt and pepper to taste. Spread tomatoes onto a baking sheet lined with a Silpat Mat or foil. Bake about 15 minutes until the tomatoes are just collapsed. I love roasted tomatoes, especially cherry tomatoes, because I found they are tasty than the regular ones. I like that you add it to pasta as they really versatile. Oh, love roasted tomatoes. Salads or pasta. Always the best thing to have on hand. This is a good tutorial. So much good information. You can’t beat roasting tomatoes. There is so much flavor that comes out of those little jewels once they come our of the oven. It really isn’t difficult to do and the time it takes is worthwhile. Great instruction. I really love the simplicity of a roasted tomato, it just goes to show that you don’t need a ton of fancy ingredients to make something delicious! We often make them for adding to our pizzas, toss on some cheese and fresh basil and it is out of this world! I like the idea of these tomatoes. Sounds easy and tasty. I think it’s worth a try. Thank you for sharing this. We hit the last of the farmers market this last weekend and have plenty of tomatoes to deal with. Loving your idea to simply roast them, super sweet and delicious to so many recipes. Yum Lauren, these little beauties look like they would taste delicious. I especially love the light on the photos. You make them sound simple and delicious. Can’t wait to give the recipe a go. Cheers! I love roasting vegetables. I have never tried tomatoes though. This look delicous. wow those are some beauties there for roma tomatoes and roasted must bring out all the delicious sweetness out of them. I love roasted tomatoes, the roasting really brings out the flavors and they are so easy. Roasting vegetables is my favorite way to prepare them. I love roasted tomatoes and your pictures have me wanting to make some right away. Oh, how delicious! I’m in the mood for these, now 🙂 Love how easy they are to make! 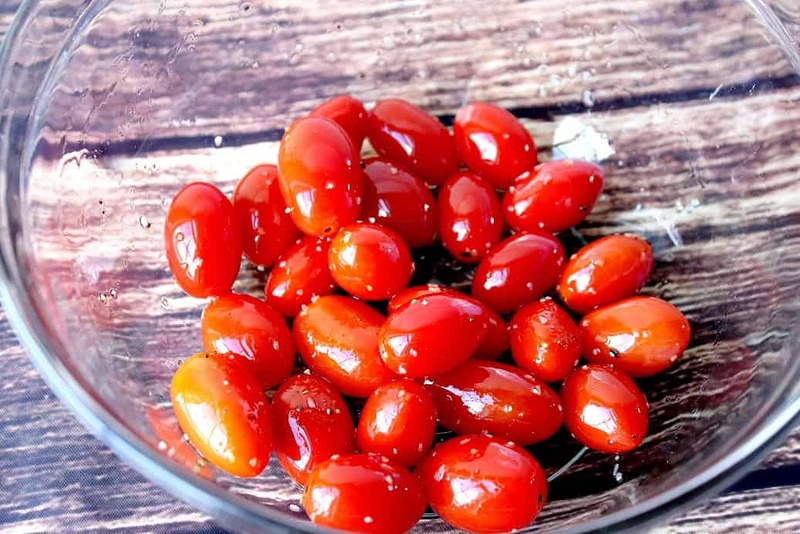 Thank you for sharing your how to on a roasted tomato recipe! It looks so good and easy enough to do! I can’t wait to try this new recipe soon!! Oh man, these are my favorite, but I always just buy them already done! I’ll have to make some of my own now! Yay – hope they turn out delish! Super awesome – I love roasted tomatoes! Do you freeze them or use them right away? Looks so good! I wish I had this recipe in the summer when our garden was spitting these out like crazy! !